Located on the dreamy and aptly named Sleepy Hollow Lane, Sunset Cove will serve as your (beachfront) home away from home in the heart of Laguna Beach. Walking distance to some of Laguna’s finest restaurants, art galleries, cafes, and shopping, it may be sleepy, but there’s plenty to do! From staycationers to those who are visiting California for the first time, the Villas have earned a five-star rating from travel sites like TripAdvisor and Yelp, keeping guests coming back time and time again. At Sunset Cove, you can say goodbye to the days of congested hotel lobbies and long check-in lines. Here they offer all the amenities of a luxury hotel or Airbnb, without the hustle and bustle of mainstream travel. Villa’s come with one, two, or three bedrooms, so feel free to bring the kids, spouse, or simply yourself… and be prepared for real life paradise. Each of the eight Villas have their own interior personality and beachworthy name (such as the “Lanai” or the “Majorca”). With granite countertops, stone and tile floors, and colorful furniture, they are professionally designed and equipped with large-screen TVs, DVD players, high-speed WiFi, and on-site laundry facilities. And, that’s not all… it is their goal to provide well beyond the cookie cutter essentials -- we’re talking jet jacuzzis, spacious outdoor patios, and fireplaces to keep your already cozy self even more cozy. While the Sunset Cove Villas have a community terrace with uninterrupted coastline views for all visitors, guests also have the opportunity to embark on private day hikes at the Laguna Coast Wilderness Park, golfing at the Monarch Golf Links, or a day of shopping in the boutiques along Pacific Coast Highway. The most popular excursion for guests, however, is a day of tanning, surf, and sandcastle building at Sunset Cove’s own Sleepy Hollow Beach, just a feet away from each Villa’s doorstep. 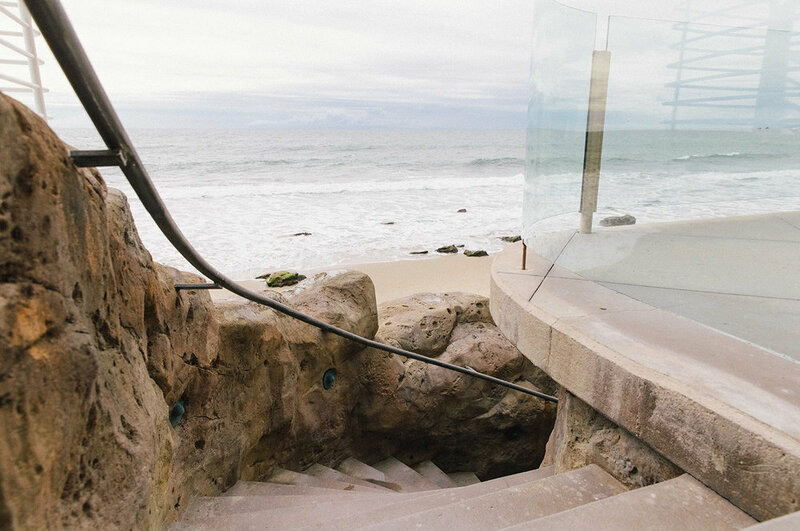 So whether it’s a stroll along the sand during sunset, an upscale dinner with a view, or just a night in watching a movie, Villa guests are in for a treat and can be prepared to be treated like royalty… with a side of Laguna. Anna Guilford is a Journalism and Public Relations senior at California State University, Long Beach and an intern at The Fullest. If she could, she would live in the Sunset Cove Villas, while writing at the beach every day. Reach Anna at annalucilleguilford@gmail.com or through her website at annalguilford.com.